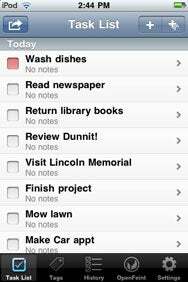 There are literally hundreds of to-do list apps available for the iPhone, perhaps reflecting that people differ greatly in their preferred approaches to listing and organizing life’s daily tasks and chores. What makes Runloop’s Dunnit worthy of consideration is that it seems to take the middle path—it’s not simply a notepad where you make a list of tasks to check off, but it’s not nearly as sophisticated as some pricier options, such as the $20 OmniFocus, a favorite of “Getting Things Done” aficionados. You’ve Done It: Dunnit’s home screen features your task list presented, by default, in chronological order. When you launch Dunnit, you’re immediately presented with your Task List, which by default organizes items from top to bottom into tasks that are overdue, due today, due tomorrow, and so on out into the future. A small icon at the top left of the screen, when tapped, provides you with the option to either remove completed tasks (they are moved to a “history” list) or to e-mail the list. Icons on the top right of the screen enable you to add either a single task or multiple tasks simultaneously. When you choose to add a new task, you can enter—in separate fields—a title, notes, a due date, whether you would like the task to be a repeating one, and also a tag. You can also choose to prioritize the task as either “Normal” or “Urgent.” When you select “Urgent,” the task’s checkbox in the task list is displayed in red, contrasting with “Normal” white task checkboxes. Dunnit comes preconfigured with a few supplied tags, such as “Home” and “Shopping,” but it’s simple to add new tags, and to view your tasks in separate lists by tag, rather than what can become a long, chronological list presented on the home screen. You can, in the settings section of the app, choose to add new tasks to the top of the list rather than the bottom, which is the default. You can also choose to change the default “due date” from “Today” to tomorrow, or “in a week,” or even a specific day of the week. Other nice little features enable you to clear completed tasks by shaking the iPhone, to choose to post your tasks to Twitter, and to play a Dunnit game via the Web-based OpenFeint platform; when you choose to do this, you must sign up for an account, but you can be anonymous. You are awarded points and advance up levels of the game by doing things such as creating 25 tasks, or using Dunnit five times in one day, or completing overdue tasks. After several weeks spent using the app, I had scored 3,704 points; I had also somehow advanced to “Level 6” without ever reaching Level 1 or 2. Aside from those puzzling aspects of the game, the attempt to make everyday chores more fun by awarding points and achievements—although virtual—could make plowing through more tedious items on your list a bit more fun. However, I would have preferred that instead of my tasks and task lists being sent to a gaming Web site, that they had been sent to a site that would have enabled me to sync my Dunnit lists to my MacBook Pro and to my iPad. But if you carry your iPhone with you all the time, this isn’t a major limitation. Dunnit, with its its simple and intuitive interface, and “just enough” approach to extra features, is a strong app for users who don’t want “manage to-do list” to become a task in and of itself.